Wooden play sets are a great investment. It is a great way for kids to spend hours of fun outside and to stay active. Wooden play sets, like other exterior wood surfaces, are subjected to weathering. Play sets are susceptible to water damage, sun fading, mold, mildew, and graying. To keep a play set in good condition, it needs to be periodically cleaned and protected with a wood stain. To begin maintenance on a wood play set, determine what is on the wood that needs to be cleaned off. If the play set has never been stained before then a good wood cleaner will do the trick. If a failing wood stain is present, a wood stain stripper should be used instead of a wood cleaner. Wood cleaners are not aggressive enough to remove old stain. If you are unsure if an old stain is present, sprinkle a few drops of water onto the wood. If the water absorbs quickly a wood cleaner can be used. If the drops do not absorb within a few seconds, an old stain may still be on the wood, so a wood stain stripper will need to be used. After determining to use a wood cleaner or stain stripper, cover any grass or plant life with plastic. Always wear eye protection and rubber gloves when working with chemicals. Remove any swings, slides, or other easy to remove attachments. Apply the cleaner using a pump sprayer. Be sure to get all four sides of each piece of lumber. It is best to start on one end and work your way across. Allow the cleaner to remain wet on the surface for 15 minutes or so. Do not let the product dry, rewet the wood with more wood cleaner or stripper if needed. Use a pressure washer with around 1000psi to begin cleaning the wood. Wash each individual board at a time working in the direction of the wood grain. Do not get too close to the wood or you risk damaging it. After using a cleaner or stripper, the wood will appear darker than normal. The cleaner raises the pH of the wood and causes this effect. To lighten the wood back to its original color, apply a wood brightener using a pump sprayer. Allow the wood brightener to remain wet on the wood for 5-10 minutes or until the wood lightens up. This is an important step, as it also opens the wood pores to provide better stain penetration. Allow the wood play set to dry for 48 hours. Once dried, use a quality wood stain and coat the entire play set. It is best to use a brush, roller, stain pad, or pump sprayer. Back brush any drips or runs and be careful not to over apply the stain. You only want to apply as much stain as the wood will absorb. Wipe any non-wood attachments off with a rag to remove drips or overspray. 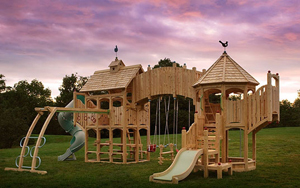 Allow the wood to dry according to the manufacturer's suggestions before allowing the play set to be used.